Use the Spypoint XCEL HD/HD2 Sport Accessory Kit to mount your camera to capture footage in a variety of sporting activities. 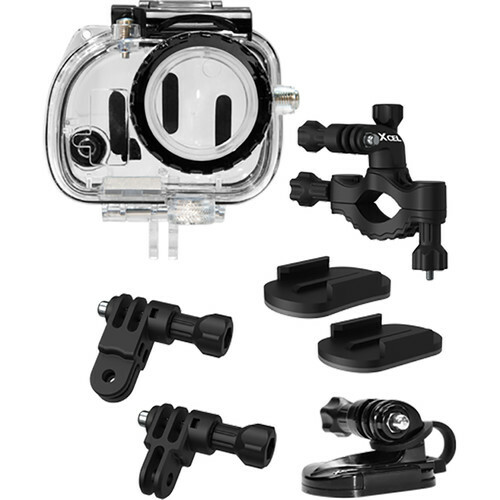 This kit includes several sports-oriented options for mounting an XCEL HD or HD2 action camera. The kit includes a clear camera housing, straight and 90° extenders, a quick release stand with safety ring, a roll bar mount, and flat and curved adhesive mounts. The camera housing is waterproof to a depth of 160'. The XCEL HD/HD2 Sport Accessory Kit can be used to mount the camera to a car, boat, bike, ATV vehicle, helmet, etc. The mounts and the extenders employ a standard GoPro-type three-prong interface. Box Dimensions (LxWxH) 6.6 x 5.8 x 3.6"